You’ve just found out your spouse cheated on you while you were married. What’s your next step? 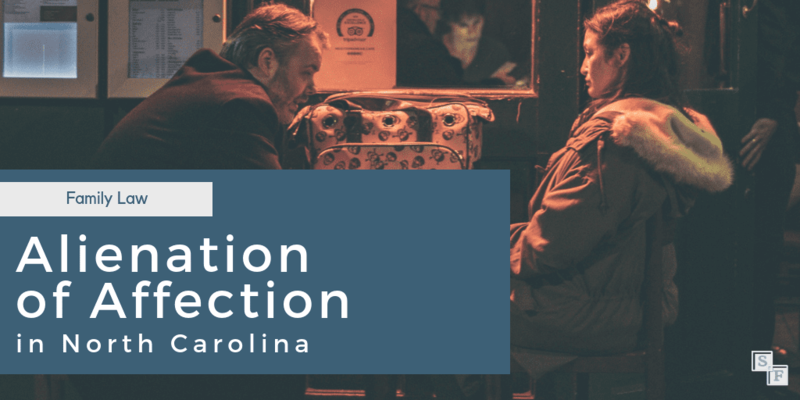 While most states have done away with this common law tort, North Carolina is one of the few states that still recognizes alienation of affection and other heart balm actions. Alienation of Affection allows a spouse to sue a third party, often referred to as a paramour, for wrongful acts that deprived them of the love and affection of their spouse. You don’t have to prove you and your spouse had the perfect, blissful marriage, only that there was some love and affection between you and your spouse. You can always use personal items, such as cards, letters, notes, home videos, and other documentation that would help to show that a genuine love and affection was present at some time during the marriage. While there are many reasons a marriage might fall apart, it is important to remember that alienation of affection is reserved for those instances where you and your spouse would still be together, had it not been for the interference of the paramour. There are several defenses a defendant can assert to an alienation of affection. Some of these defenses including claiming that there was no love and affection in existence between the parties, that they were unaware that the person was married, or that the claim is barred by the statute of limitations (discussed below). Another defense exists if you consented to the seduction and affair. It seems like an odd concept, to consent to your spouse’s affair, but it does happen. If you encourage and consent to your spouse’s affair, in an attempt to use evidence of an affair to their advantage in subsequent divorce proceedings, that would be a defense. Likewise, if you might be having a secret affair and encourage your spouse to engage in an affair, that situation the defendant can use your consent as a defense. There is a defense called “connivance,” which means if you trick your spouse into having an affair, the person they subsequently had the affair with, can raise this as a defense if you end up suing them. 1. The statute of limitations for this claim is three years. Time begins to run from the time the injury took place, meaning the date of the cheating. However, if it is an ongoing affair, the three-year window does not begin to run until the actual act, or affair, is complete. Another important piece of information to remember is that the statute of limitations begins to run at the time of the cheating, not when you become aware of the cheating. For example, if your spouse cheated on you six years ago, and you just found yesterday, the three year statute of limitations has already expired to bring a claim for alienation of affection. The exception to that example would be if your spouse’s affair six years is ongoing, and still ongoing when you become aware. 2. Your private affairs will become public record. With a few exceptions, every court case filed is public record. Often times these cases involve confidential, personal information. Remember, once a lawsuit is commenced, the opposing party has equal opportunity to respond with their own information. Sometimes, the threat of an alienation of affection lawsuit can be used as leverage due to the sensitive and personal nature, meaning the cheating spouse may not want their “dirty laundry” in public records. It’s important to weigh out the benefits and risks of filing this type of lawsuit before proceeding. Often, during times of high stress such as a divorce, it’s best to seek outside, neutral counsel. An experienced Charlotte family law attorney can walk you through your options, present the facts and potential outcomes, and help you best understand how your life will be impacted. Considering filing for alienation of affection, filing a separation agreement, or proceeding with divorce? Contact our team today.